In 2010 YTD my "Explore Portfolio" gained 20.4%!! 2010 was another great year for stock market investors. The Dow Jones Industrial Average gained and the S&P500 both had double digit returns. When you include dividends, the DOW and S&P500 gained 13.8 and 14.9%, respectively. 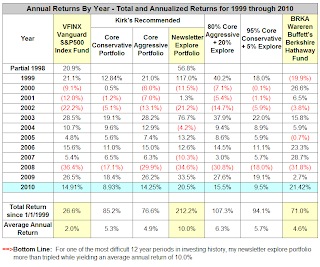 2010 was an even better year for "Kirk Lindstrom's Investment Letter" where my "explore portfolio" handily beat the S&P500 yet again with only 70% in equities! After gaining 33.5% in 2009, my "explore portfolio" in 2010 gained another 20.4% to finish higher than it was at the end of 2007 and just a few points below its all time high. 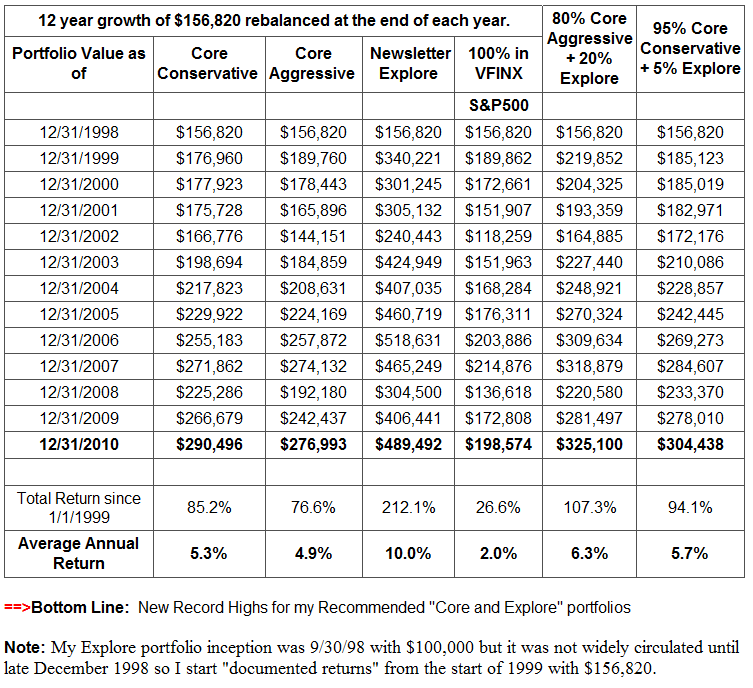 The two "total portfolios" that I recommend for aggressive and conservative investors finished 2010 at new record highs! How many can honestly make that claim? 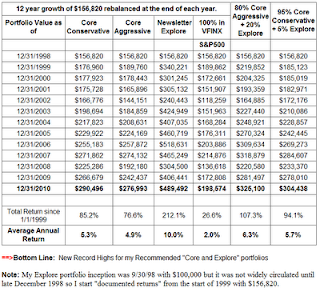 This shows how the "core and explore" portfolios are making new highs. I won't show you my actual trade confirmations like Kirk does at times, but I've done extremely well following the Core & Explore philosophy favored by Kirk's Investment Newsletter. I'm retired and play VERY conservative. I'm quite happy with 12.8% in 2010. I'm sure anyone that builds their portfolio following this Core & Explore strategy will be quite happy with the performance. 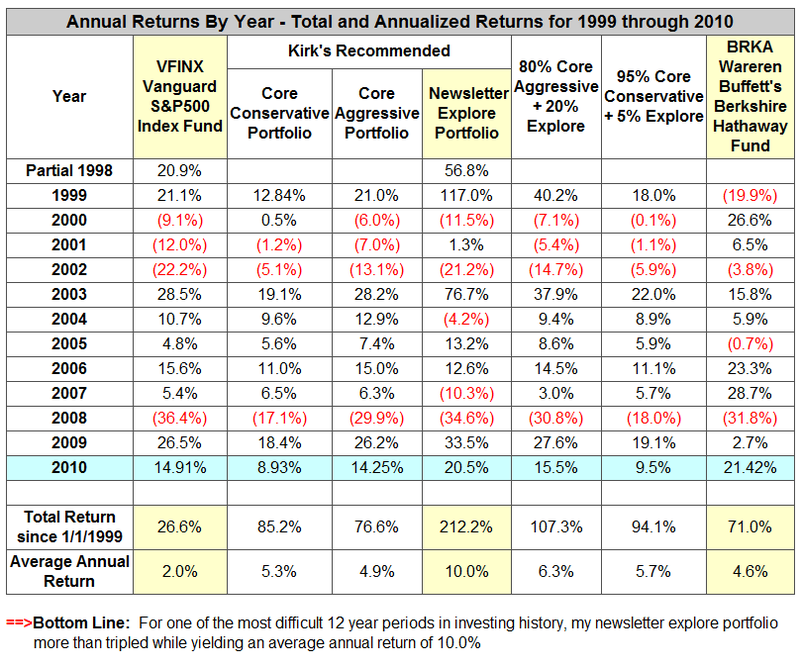 Unlike some Advisors, Kirk puts the performance of his trades, good AND bad in the Newsletter every month. PS. I'm on 'House Money' in FNSR and almost there in VLNC. House Money is what I used to call my Black Jack play when I'd put away my own money and was playing with the days winnings. I’ve been taking Kirk’s newsletter for eleven years see a significant upgrade in my future. This method is disciplined and effective. It really helps diminish the emotion and improve my returns. As I approach retirement I appreciate the excellent results while at the same time taking less risk. It is rare you get the best of both worlds. Subscribing to Kirk’s newsletter has been the best bargain in my life.